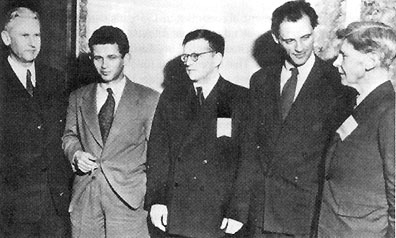 Left to right: Alexander Fadeyev, Norman Mailer, Dmitri Shostakovich, Arthur Miller, Olaf Stapledon. Shostakovich only went because Stalin made him. why don't men stand around looking like norman mailer anymore? I'm afraid that the example Mailer ended up setting might have ruined that stance for everyone. is it me or does mailer look like lee harvey oswald? its just me, right? Oh come now! It's a peace conference!